It’s pattern is that of a first or second century belt fragment shown at the National Gallery of Art, Washington D.C. Dec 14, 1974-March 30, 1975, part of the exhibition of Archaeological Finds of the People of China. Thirty years ago, the Chinese brought over quite a show. Thousands of pieces were on display. The immense exhibit presented archaeological treasures spanning 50,000 years in China. Spindles, needles and fabric impressions left on pots show proof of cloth production 7 thousand years ago. The Eastern Han Dynasty (1st and 2nd century AD), produced a hand mitten of 5 color silk damask, and a silk damask fragment of 8 colors woven 52 warps per cm. Ten ancient fabric fragments were presented including one 11 1/2″ long wool fragment, that was immediately recognizable to those who know such things as an inkle weave. There were lots of truly amazing and wondrous works to see, but we’ll just focus on the fiber. The gallery book is temporarily available in the reference section of our library. David Parkinson has been familiar with fiber all his life. As the second son of a prominent local weaver, he grew up with dye pots in the kitchen and looms in the living room. His father designed and built inkle looms and other weaving tools/toys for the woman he adored and her fibered friends. The fact that David grew up to be a talented fiber artist should surprise no one. If his weaving isn’t directly inherited, he absorbed it’s foundation through extended childhood immersion. When David dropped into the National Gallery to explore, he was naturally drawn to the piece that looked so much like what his mother Bertie had studied and taught others to weave. He planted himself in front of the display and scribbled out the color arrangement and thread count. He sent his notes back to Cleveland Heights, and asked his mother to make a belt. 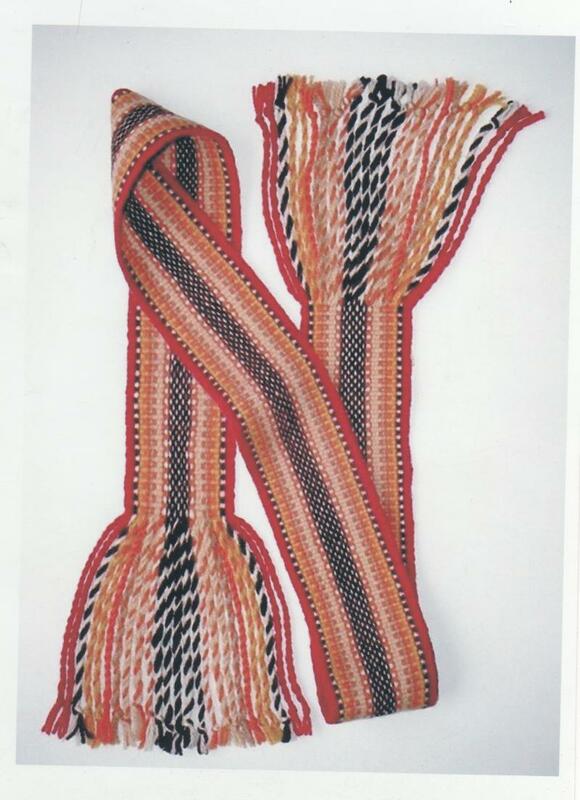 Bertie wove a sturdy belt, 4″ wide, 75″ long, including 10″ of twisted fringe at each end. She sent it to David, who went back to the exhibit to see how they did. He drew quite a crowd of guides and docents when he pulled it from his pocket and held it up to compare. The colors were wrong, and it was unbalanced to the modern weaver’s eye, but the pattern was true. Receiving the report, a great debate ensued. David insisted an ancient pattern must be reproduced, flaws and all. Bertie rewove it, matching the ancient colors and design to satisfy her son and honor the vision of the original weaver. Then she wove a third belt, balancing the design to please herself, and make our Bertie’s belt. Bertie’s belt is on loan to CWG and available for viewing through our library.